Thank you to Superberries for sponsoring another great giveaway! Can’t Wait?! Use Coupon Code “AFRUITS5″ to receive a $5 discount code from Superberries’ website. This giveaway ends on February 28, 2015. A random winner* will be chosen in a drawing on March 1, 2015. The giveaway is open to all addresses in the continental USA. Be sure to join Superberries on Facebook, Twitter and YouTube. I would like to win so i can incorporate different antioxident berries into my diet. I would love to win because Ive really been trying to be more healthy and all this stuff seems so cool! 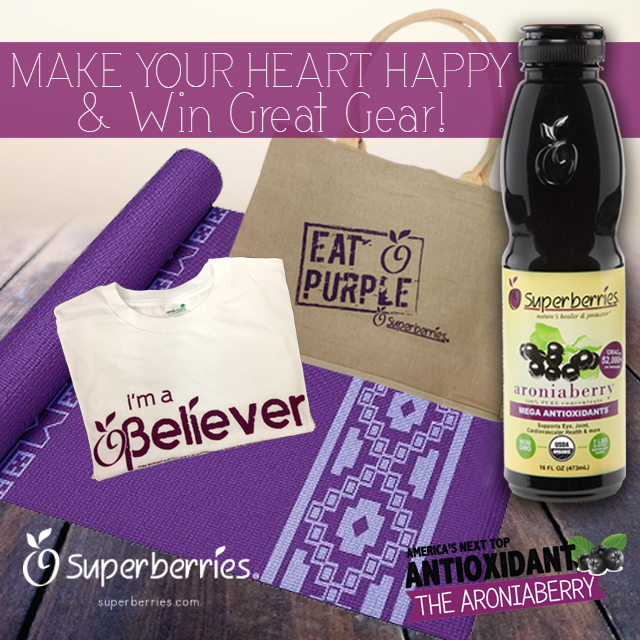 Why would you like to win the Superberries Heart Month Gift Basket? -I’d love to try the Superberries’ Antioxidant drink which is very good for my body. 😀 Also, the yoga mat is just perfect for my sister. She recently told me that she wants to try yoga but then we still don’t have a mat. I am doing everything I can to eat healthier and take care of my body as well as I can in 2015 and beyond. Winning this basket would help me achieve my goal! It looks like a great way to start a healthy new year! I would love to win super tasty, healthy fruits to share them with my 97 1/2 year old Grandma. I would love to win for my heart health.